Guadeloupe, a chain of islands in the Lesser Antilles, is a region belonging to France. Many of it’s 400,000+ inhabitants speak Antillean Creole, though the official language is French. Part of the Leeward Islands, Christopher Columbus was the first European to discover Guadeloupe in 1493, dubbing it Santa María de Guadalupe de Extremadura. 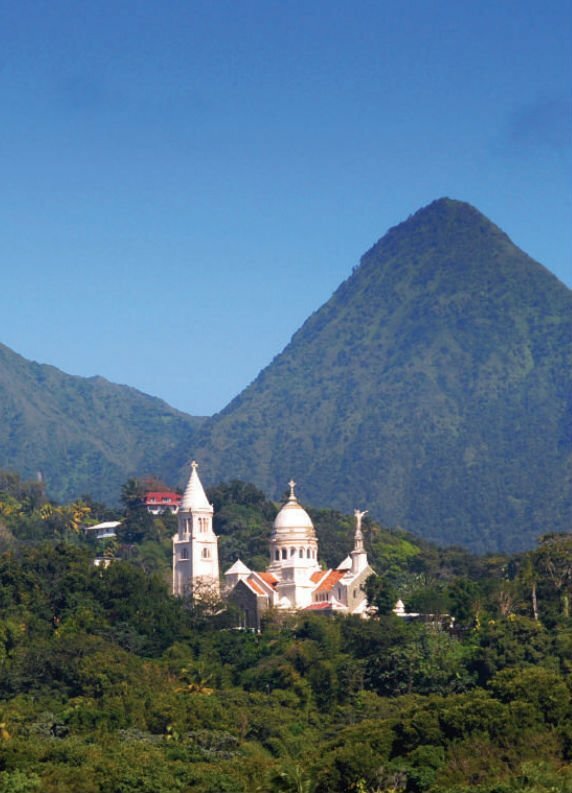 The main island of Guadeloupe and the surrounding islets are rife with exciting culture: you’ll find an intriguing mix of French, Creole, African, European, and East Indian cultures, observed in everything from dress to speech to cuisine. You will want to sample delicious dishes of all kinds in Guadeloupe. Many visitors travel to the butterfly-shaped island of Guadeloupe every year, as it is a perfect paradise with ample opportunities for enjoyable activities and cultural experiences. 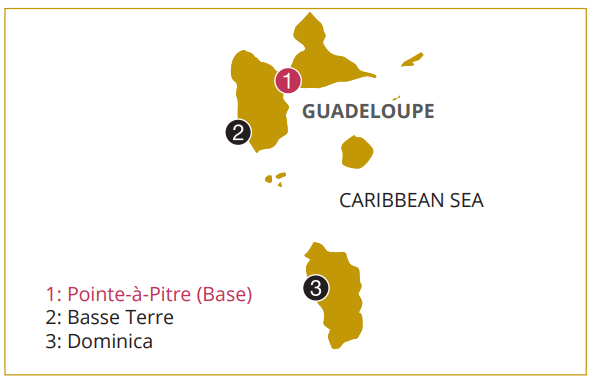 The two sides of Guadeloupe, separated by the Salt River, are Grand-Terre, in the east, and Basse-Terre in the west. 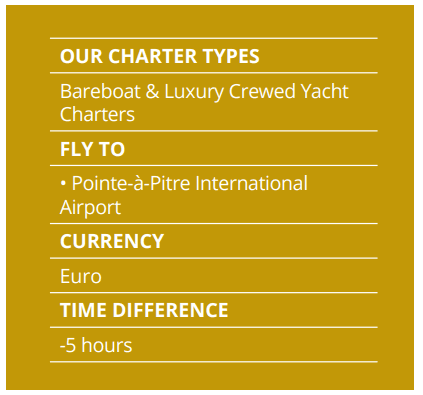 If you’re looking for shopping, dining, and interaction with visitors and locals alike, you’ll likely want to stick to Grand-Terre, and you’ll want to make sure you visit Pointe-à-Pitre, the island’s biggest city and touristic center (and the convenient base of Dream Yacht Charter). More undeveloped, untouched space is found in Basse-Terre, where a large national park is located. Throughout the main island of Guadeloupe and beyond, you’ll find vibrant rainforests, scenic sugarcane fields, and plenty of fascinating wildlife. 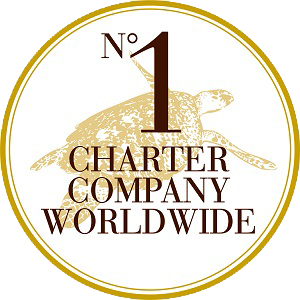 As you traverse the Caribbean waters surrounding the islands on your yacht charter, you’ll find spectacular turquoise-hued seas filled to the brim with gorgeous ocean life. Sailing is wonderful here, and can excite all levels of experience.Incredible waterfalls are found on Guadeloupe, including Crayfish Waterfall with its relaxing pools for perfect swimming, or the more dramatic Carbet Waterfalls to see waters cascading for 350 feet. If snorkeling or diving are on your yachting itinerary, look no further than the Jacques Cousteau Underwater Reserve. With its incomparable coral reef and marine life, this is one of the world’s top spots for these water activities. Whatever you are looking for, with its variety and beauty, Guadeloupe is an ideal holiday option for your next family sailing vacation or romantic boating getaway.